We were on the 8:15am Swans Island Ferry when I declared, "I need a latte and a lobster roll, STAT." I didn't expect to find both, and that they would both be good. I'm a Yelp hater in my own town, but when in unfamiliar territory I'm glad my search for "latte" and "lobster roll" plus "open now" lead me to Coffee Hound in Bar Harbor. The town is super cute, but you just know it was so much cooler a decade ago. It's a tad lousy with tourists, cruisers and chain hotels for my taste. But Coffee Hound's owner turned me around as he served up a perfect flat white, his grandmother's lobster roll and a blueberry pie. For breakfast. Swoon. We took them to the gorgeous park across the street and soaked it all in before the drive back to Portland. 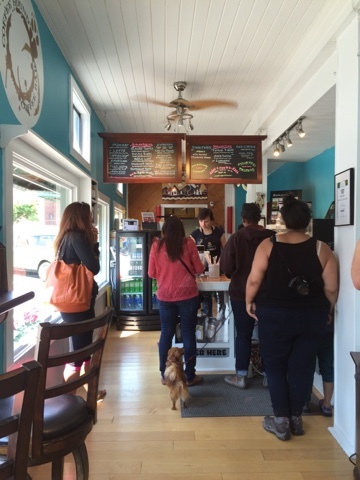 Coffee Hound Coffee Bar is located at 27B Main Street in Bar Harbor. It's open May through October, so get moving. 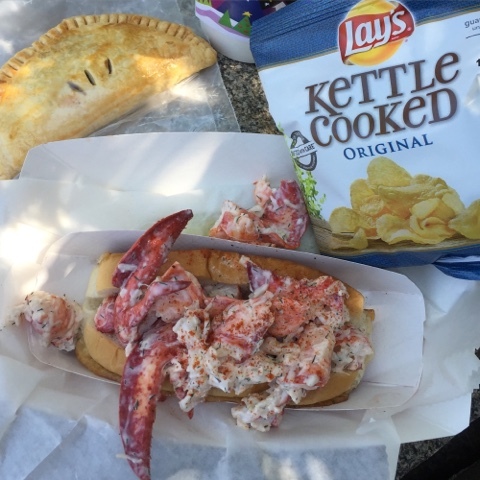 So far, it's vying for Eventide as my favorite lobster roll in Maine. Click here for all of my Maine posts!